It's been over four years since we've heard anything about Konami's remake of PlayStation strategy role-playing game Vandal Hearts for the Nintendo DS -– and lo and behold it's not a remake or on the DS. Vandal Hearts: Flames of Judgment is actually a prequel to the original Vandal Hearts, coming to Xbox Live Arcade and PlayStation Network. With multiple endings and player characters that supposedly adapt to the user's style of gameplay, Flames of Judgment won't have to suffer the test of nostalgia. But it will have to live up to modern expectations of SRPGs instead of the ones that we judged the original Vandal Hearts by. Flames of Judgment is a strategy RPG that serves as a prequel to the original PlayStation SRPG Vandal Hearts. It's an Xbox Live/PlayStation Network downloadable game, which is not all that common for the gameplay genre. The story follows stereotypically plucky youth, Tobias, and his friends as they fight for the peace in the land of Sostegaria. 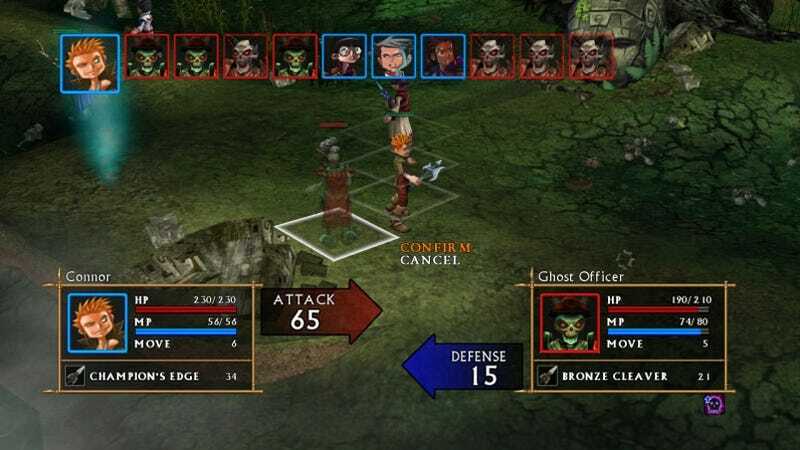 The demo level takes place in a haunted battlefield in a forest area where the hero's party gets jumped by skeletons and wolves. I watched one journo play through the level and win, which took about half an hour. When it was my turn, I played through the level and tried to lose by getting the main character killed. I managed it in only 15 minutes, but that didn't result in a demo fail and the power went out on that side of the venue before I could get all five party members killed. The demo build didn't look too rough and certainly wasn't buggy, but the game won't be out ‘til September. Not Enough Nostalgia Appeal: It's been a long time since Vandal Hearts and I'm not sure that it has the cult following that would demand that changes to gameplay be kept to the minimum. Even if it did, why not remake the game completely to capitalize on that fanbase? Slow: According to the press release, the classic combat of Vandal Hearts has been streamlined so that it "combines the speedy RPG pace of the original […] with improved user mechanics" – but I didn't really get that feeling from the demo. There were only about three menus to navigate through during a turn phase (four, if you're changing weapons) to move a character and then have them attack or cast a spell, but the characters moved so slowly, the combat phase didn't really feel as fast as other SRPGs of the day. No Flanking Bonus: One of the things I like best about newer RPGs is the concept of a flanking bonus. If I manage to get all my units surrounding an enemy, I should get a major damage bonus when attacking that enemy. Because Flames of Judgment isn't a remake, there is no excuse for failing to include this and perhaps some other updates that the SRPG genre has adopted over the years. It's On Console: The absolute biggest gripe of many SRPG fans is that you can only get your fix on a handheld device. This is doubly bad because many SRPGs don't have the hang of quicksaves, so the games don't necessarily work very well on handhelds despite always being made for or ported to handhelds. It's On XBLA And PSN: The game deserves a tiny bit of street cred for being different in terms of distribution if not for being innovative on other fronts. It's Pretty – Kind Of: The characters lack the cutesy appeal of many portable SRPGs, but the colors are rich and vibrant. So at least you have something to look at while your character takes a bit too long to cross all those squares before attacking. Honestly, I'm having trouble putting this game in context, especially since the power failed during the demo and the information provided in the press packet (see below) doesn't really give many details about what makes Flames of Judgment special or awesome. I don't even know if there's any kind of multiplayer or plans for DLC support. I do know that SRPGs are a genre that either you love or hate. The fact that Flames of Judgment is a prequel to a classic won't change that; it'll just draw in a few of the gamers who loved the original Vandal Hearts. I have a feeling they're going to be disappointed.